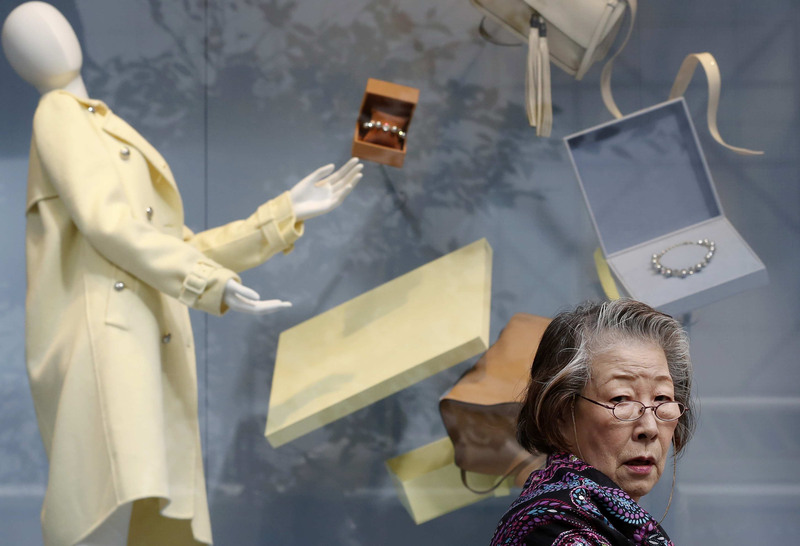 The economy unexpectedly sank into a recession in the last quarter, unable to shake off the impact of April’s consumption tax hike and raising the odds that Prime Minister Shinzo Abe will postpone a second increase next year. Gross domestic product shrank an annualized 1.6 percent in the three months through September, the Cabinet Office reported Monday, a second consecutive decline that matches the textbook definition of a recession. Unadjusted for price changes, the economy contracted an annualized 3 percent, the Cabinet Office said. “April’s sales tax hike completely destroyed Japan’s economy. 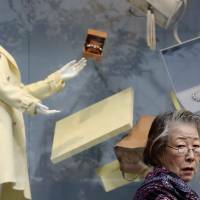 No part of the economy looks encouraging,” said Yoshiki Shinke, chief economist at Dai-ichi Life Research Institute, who had forecast a 0.8 percent rise for real GDP, the weakest estimate in a Bloomberg survey. “Today’s data will leave another traumatic memory for Japanese politicians about sales tax hikes,” he said. The nation also tipped into a recession after the levy was raised in 1997, causing the government at the time to fall. For Abe, the report may guarantee he will put off the second tax increase scheduled for October 2015, a development observers say will trigger a snap general election next month. While exports and consumer spending returned to gains last quarter, and government spending had a positive impact on GDP, this wasn’t enough to offset the impact of a slump in stocks of unsold goods, a sign that companies were unwilling to boost production. Residential investment was another soft spot. Nominal GDP, which is unadjusted for price changes, also shrank for a second straight period, marking at least the fifth recession using those criteria in the past decade. This figure, which is critical when considering tax revenue and corporate profits, is 7.9 percent below the peak reached in 1997, according to data compiled by Bloomberg. The Abe administration is seeking to shore up public support after April’s levy increase triggered the deepest contraction in more than five years. Etsuro Honda, an adviser to the prime minister, said last week that a tax increase is out of the question if growth turned out to be less than 3.8 percent. 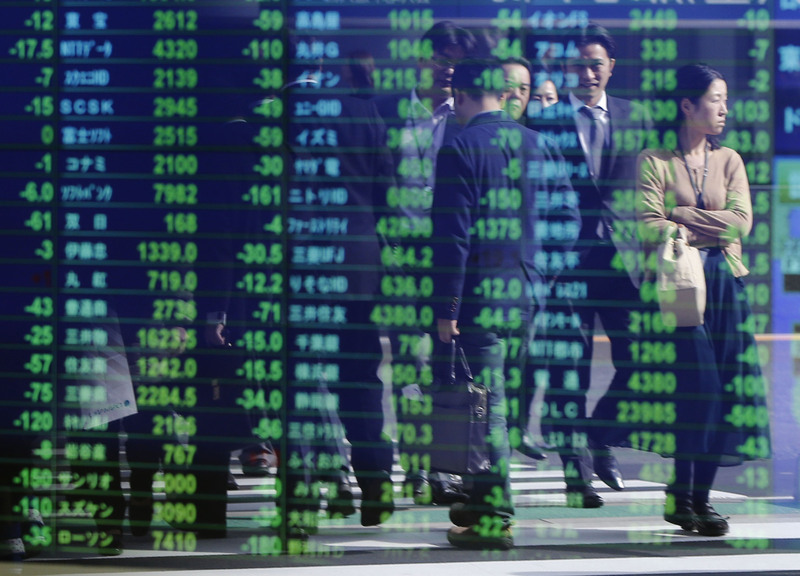 Stocks plunged in Tokyo and the yen slid against the dollar after the data were released, briefly dropping below the ¥117 level for the first time since October 2007. Abe is considering postponing the next tax increase until 2017, sources with knowledge of the talks said last week, and while a general election isn’t due until 2016, he will call an early vote to get public backing for his move. Minister of Economy, Trade and Industry Akira Amari said Monday that Abe would make a decision as early as Tuesday. 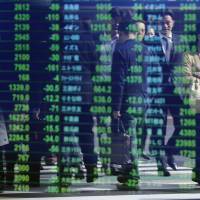 The GDP data were released two days before the Bank of Japan’s next policy meeting. BOJ Gov. Haruhiko Kuroda last month led a divided board to surprisingly expand a monetary-stimulus program already unprecedented in scale, after inflation forecasts drifted lower and further away from his 2 percent target. While the pace of consumer price gains is running at about 1 percent, that still amounts to a sea change for households accustomed to modest deflation for about 15 years. Hiking the sales tax to 8 percent from 5 percent in April also pushed up the cost of living, straining households already pressured by the rising prices. With inflation outpacing wage growth, a further bump in the levy slated for next October, to 10 percent, risks hurting consumption and undermining Abe’s support. He has the power to call off the hike, the second of the two-stage increase legislated by the previous government, based on the health of the economy. The median forecast for annualized real growth last quarter was 2.2 percent. The median estimate for nominal GDP was for a 0.4 percent advance. Compared to the previous quarter, private consumption rose 0.4 percent in the July-September period, compared with a 5 percent drop in the second quarter, the Cabinet Office report showed. Capital spending dropped 0.2 percent in the quarter, compared with a 4.8 percent decline in the previous three-month period. Net exports, or shipments less imports, added 0.1 percentage point to GDP, after a 1 percent gain in the previous quarter. In December, the government approved a ¥5.5 trillion addition to the budget in December to help the economy weather April’s tax hike. Finance Minister Taro Aso has signaled readiness to boost stimulus and Abe said last week he would consider compiling an extra budget depending on the economy. The government is considering measures that may amount to between ¥3 trillion and ¥4 trillion to support the economy, according to a Yomiuri Shimbun report Oct. 31. Abe’s ruling Liberal Democratic Party is considering steps to protect against the impact of a weaker yen and higher energy prices as part of a campaign platform for a possible election, the Nikkei newspaper reported last week. A group of LDP lawmakers who want to delay the next bump in the sales levy estimate the government could have as much as ¥4.6 trillion available to spend on its economic stimulus if it doesn’t increase the sales tax next year. Postponing the planned increase by about 18 months would add about 0.5 percent to growth, the group said in a discussion paper obtained by Bloomberg News. The lawmakers, led by Lower House member Kozo Yamamoto, estimate that this expansion would have a bigger impact on the amount of tax raised than increasing the levy and risking another economic contraction. In 1997, then-Prime Minister Ryutaro Hashimoto oversaw a 2 percent boost in the consumption levy. The move cost him his job as the country sank into a recession, with consumption swooning against a backdrop of weakening demand abroad in the midst of the Asian financial crisis.